The GSMA, the global trade group for the mobile industry, releases a quarterly report on the growth (or lack of growth) of GSM, GPRS/EDGE, W-CDMA and HSPA subscribers, terminals and operators. In the latest report (August 2008), it announced that the number of worldwide subscribers using Mobile Broadband (HSPA) networks has topped the 50 million mark from 11 million one year ago. This indicates that global uptake of HSPA technology among consumers and businesses is accelerating, indicating continued traffic growth for high-speed mobile networks worldwide. 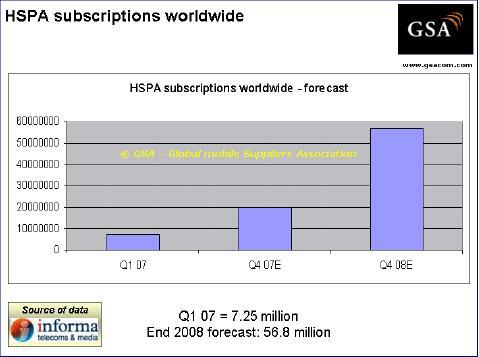 Wireless Intelligence expects the number of HSPA connections to be growing by 4 million per month by the end of 2008. The surprise here is that in its report released earlier, the number of HSPA subscribers were estimated to be around 56 million by end of 2008 (See accompanying figure). A rare occasion when reality has definitely overtaken hype! We should not be surprised if the real number is close to 75 million by end-2008 given current subscriber growth rates. In October 2007, there were roughly 403 HSPA devices (a mixture of mobile phones, dongles, routers and notebooks) launched by 80 suppliers. That number has almost doubled to 742 HSPA-enabled devices available from 117 manufacturers. Furthermore, in February 2008, there were 174 commercial HSPA operators and that number has grown to 191 in the latest survey. 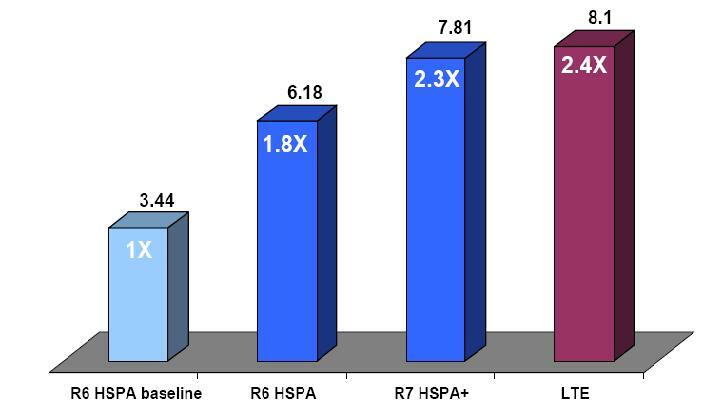 The most widely-deployed peak data speeds over HSPA are currently between 3.6Mbps and 7.2Mbps. This translates to an end user speed of more than 1Mbps, comparable to many of today’s fixed line broadband services. There is a running counter of Mobile Broadband connections around the world on the GSMA’s dedicated website: hspa.gsmworld.com.